You don’t need to see the Firehouse Headquarters (75827) from the Ghostbusters franchise in real life to appreciate that it is an impressive building, but let’s see anyway! LEGO have released high resolution images of the Firehouse Headquarters (75827), which is due for release on 1 January 2016. Looks like this is going to be a awesome parts pack, with lots of Dark Red, Light Bluish Grey and Tan bricks, as well as plenty of doors and windows. Mind you, it is such a great looking set that it might be hard to bring yourself to take it apart! 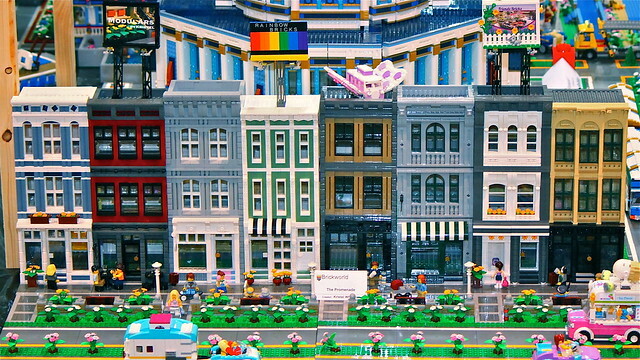 See all the high resolution images of the building here or on LEGO’s Facebook page. The Cast Iron Modular was one of the eight buildings included in The Promenade, and one of the two whole new ones. As the name suggests, the Cast Iron Modular was inspired by the cast iron buildings of New York. Unlike most of my modulars, this one is not furnished. I am really happy with how it turned out, but I struggled to think of what it should be. It’s a shop, but I’m not sure what it should sell. And after building it four times already, I’m ready to move on, so this one will stay unfurnished! I’ve just arrived home today from BrickWorld Chicago and I must say it has been one of the most memorable experiences of my life. It was fantastic to meet everyone and see the amazing MOCs. Truly inspiring!! From left to right, there is a new sand blue building (yet to be named), Trilogy, a 16-stud version of Sugar & Spice, Blooming Blossoms, 16-stud version of Black Velvet, remodelled Psychiatrist’s Office, Coveted Clutch and a new tan and black building (yet to be named). You can find some more images of these buildings on Flickr. A big thank you to Pete (RedCoKid) for taking these shots for me. That’s his Aerial Arena you can see in the background. I don’t think it is possible to fully appreciate the scale of the Aerial Arena until you see it in real life. It is simply huge! I also had an absolute blast being part of the EuroBricks collaborative layout (more on that in Part Two). I can’t wait for BrickWorld Chicago 2016! If you’re a sweet tooth, the Modular Candy Store by eliza is sure to have something to satisfy any sugary craving! The facade was designed to look like a 1890s iron facade and is just gorgeous. I love the colour scheme and the clever use of the ladder piece to create the trim above the shopfront. The inside is fully furnished with a pick-a-brick equivalent, but for sweets, as well as a party room to make the most of all the sweets on offer. See it on flickr! The Wine Shoppe by ‘talos’ has everything you need to quench your thirst! My favourite parts of this cast iron inspired facade are the middle floor windows and how the Bright Light Orange in the window canopy offsets the otherwise muted white and grey tones of the building. This building also has an interesting back, with a stepped effect created by the three levels and an outdoor terrace on the top floor. Head over to Eurobricks to see more images of the fully furnished Wine Shoppe. After a while away, we get not just one, but three new modular buildings to feast your eyes on from one of my all time favourite builders Sonicstarlight (Jonathon Grzywacz). The first is Bricklyn Bike, which sells and repairs skateboards, bikes, scooters and motorcycles. I love the colour scheme and industrial feel of this building, as well as the cute little bike above the front door. The next two are the Jewelry Store and Pizzeria, which are immediately recognisable as being inspired by the LEGO Creator set Bike Shop & Cafe (31026). Both buildings have apartments upstairs. I’ve taken the liberty of using the image that shows the buildings with the apartments swapped. I like this more so as the colours feel more harmonious to me in this combination. 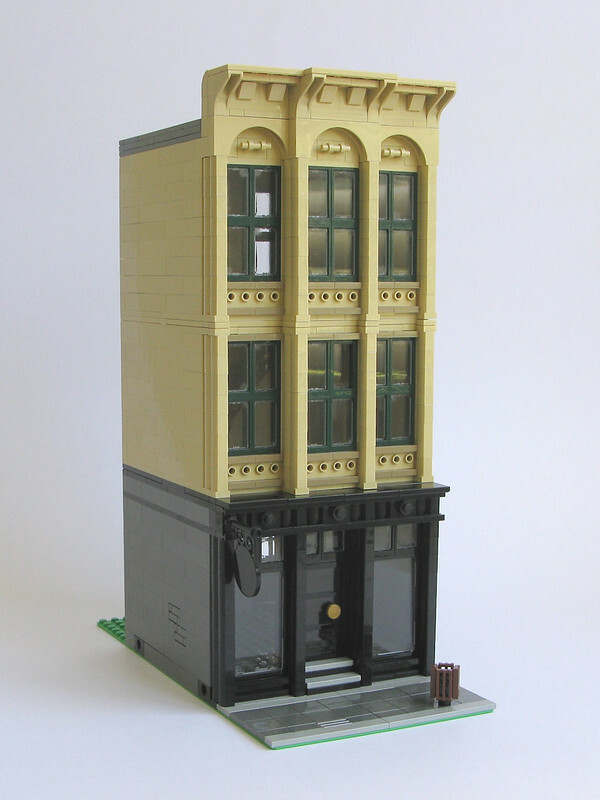 There are lots more images of both the exteriors and fully furnished interiors available in the Flickr albums for the BrickLyn Bike and the Jewelry Store and Pizzeria. I’d like to present to you my third New York-inspired building, the Sugar & Spice, which is named after the cupcake store on the ground floor.